View the video of our Managing Director Percy Vij outlining the capabilities of our new presses,as he explains the vast array of special effects these machines are capable of producing. 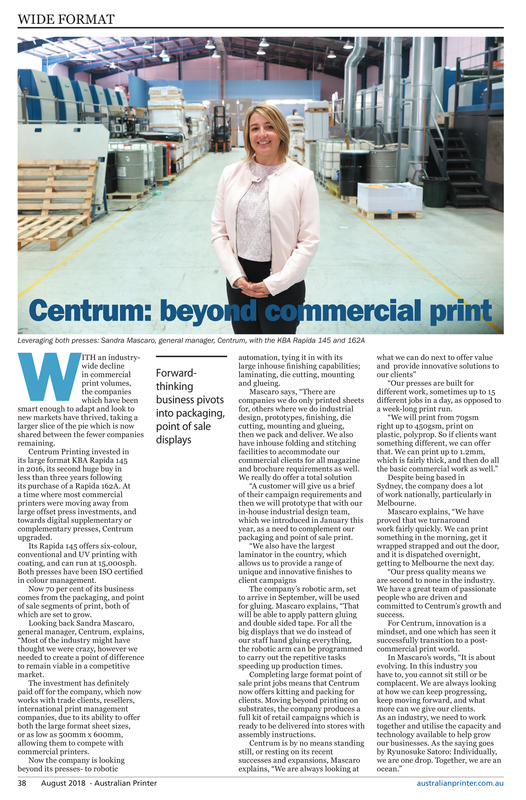 In August 2018 Centrum featured in Australian Printer magazine with an article outlining the smart approach Centrum has taken to adapt and thrive in new markets. In a time where most printers are struggling to survive, Centrum have taken the bold step and purchased two Rapida presses allowed it to forge ahead into the packaging and point of sale markets. Now 70 per cent of its business comes from the packaging and point of sale sales segment of print, both of which are set to grow. Looking back, Sandra Duarte, general manager, Centrum, explains, “Most of the industry might have thought we were crazy, however we needed to create a point of difference to remain viable in a competitive market. To read the full article click here.